distribution Extreme southern portion of the state; recorded from Robeson County on the west to Pender County on the east. As one would surmise, NC lies at the northeastern corner of the species' range. abundance Though common in much of Florida, it is rare to locally uncommon in its small range in NC. flight Late spring to midsummer; generally from the latter half of May to early August, plus a quite late record (photo) from 2 September. habitat In NC, it has been seen only along blackwater rivers and large blackwater creeks. Over the range as a whole, it favors swampy areas along slow-moving waters, such as habitat suitable for alligators (fide Chris Hill). Thus, it could occur in NC in swampy backwaters or other waters away from rivers. behavior The species perches readily on the ground such as riverbanks or pond margins, and can be conspicuous where it occurs. comments For a clubtail, this is one of the easiest species to identify. The sides of the thorax are essentially unmarked and very dull, washed-out gray-green or pale green. Most other clubtails have conspicuous diagonal dark or light stripes on the thorax. Chris Hill observed 19 individuals on 13 July 2014 along the Little Pee Dee River in SC, perhaps only 10-20 miles down the Lumber River (same body of water) from the NC/SC state line. 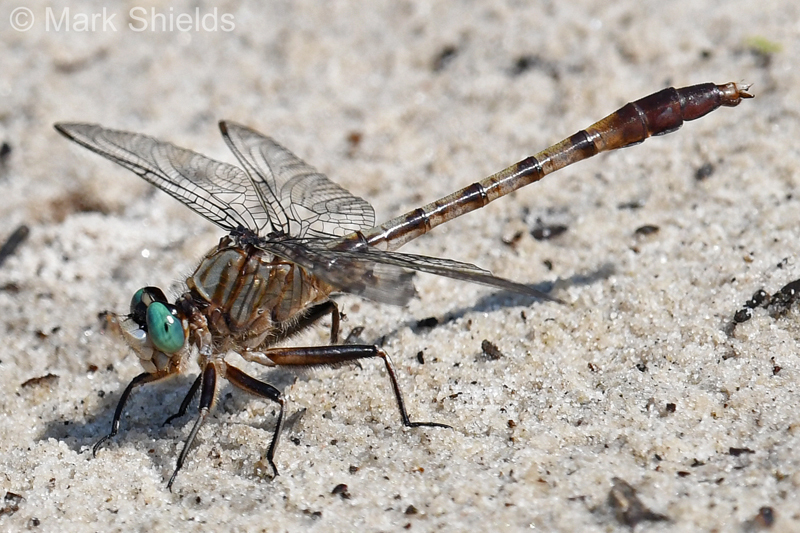 In 2016, Mark Shields re-located the species (two individuals) at or near Duncan Cuyler's original location along the Northeast Cape Fear River in Pender County; he also photographed one on the Brunswick County side of the Waccamaw River. James Reber also photographed one near the known Pender County site, in June 2016. As predicted from the results along the Waccamaw River, the species was discovered in May 2017 by Shields by kayaking the Lumber River, and thus adding Robeson and Columbus to the known counties of occurrence in the state. New Hanover County was added for the first time in 2018, as was a new location in Brunswick County, where the breeding site is likely along a creek (Town Creek) and not a rather large river. Comment: New Hanover, 2018-06-08, Northeast Cape Fear River at Riverside Park, Castle Hayne. First record for county. Comment: Columbus, 2017-06-04, - Several males still below spillway from Lake Waccamaw. Comment: Pender, 2017-05-26, Holly Shelter Game Land, Holly Shelter Boating Access Area, dike between Northeast Cape Fear River and greentree impoundment. - 2 males, 1 female.